The next generation of Coombelands Jockeys! 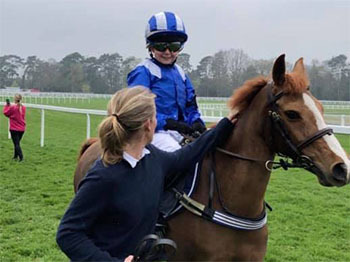 The Lord Leconfield Pony Club Raceday took place at Ascot Racecourse yesterday (Monday 8th April) and a group of budding young jockeys based at Coombelands took part! We are delighted that Sash won at Lingfield today for his owner, Prince Khalid Abdullah. Ridden by Andrea Atzeni he tracked the leaders before being driven inside the final furlong and stayed on to lead in the final yards to beat the Richard Hannon trained Doughan Alb by a neck. Well done to Marion Ripoll who looks after Sash at home. We were delighted to receive our 2019 Horses In Training brochure this week. Please click on the link below to have a look or let us know if you would like to receive a hard copy in the post. We are delighted that Thresholdofadream got her head in front to win at Lingfield today for owners Derek James and Barry and Fiona Reilly at Woodcote Stud. Thresholdofadream was held up towards the up rear before closing in on the leaders entering the final two furlongs, she was ridden over one furlong out and ran on well under pressure to lead well inside the final furlong to win by a head under Joe Fanning. 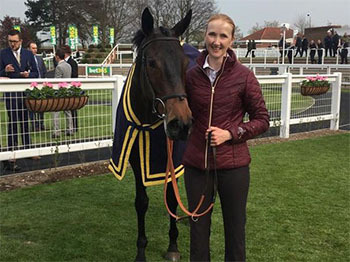 We are delighted for our head lad Dean whose horse Double Legend won the ‘Bet At racingtv.com Handicap’ at Kempton on Saturday when ridden by Robert Havlin. Having run well at Kempton in his first two starts in handicap company finishing 3rd in December and 2nd in January, Double Legend was driven to lead over two furlongs out on Saturday and ran on well in the final furlong to beat Zamperini. On behalf of an owner we have a potential broodmare for sale, Flitare is a three-year-old bay filly by Oasis Dream out of Federation. The second dam Flirtation is the dam of six winners including Attraction, five-time Group 1 winner and champion two-year-old filly in Europe. Attraction is the dam of Group 3 winner Elarqam and also young sire Fountain of Youth – 2019 will see his first two-year-old runners. 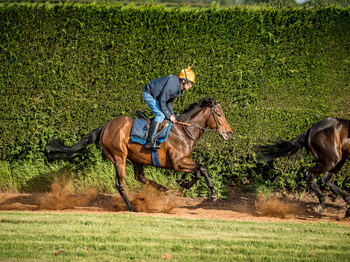 We are delighted that Inhale has won at Kempton this evening. Ridden by Jim Crowley she quickened to lead from one furlong out before running on well to win comfortably by two lengths. We are pleased for her owner, Prince Khalid Abdullah. Well done to Danielle Smith who looks after Inhale at home. We enjoyed a super morning last Saturday for our Yearling Parade. We welcomed 80 owners and guests to Coombelands to see the new yearlings and horses-in-training being paraded before everyone enjoyed champagne and canapés provided by Maria Shiner catering.